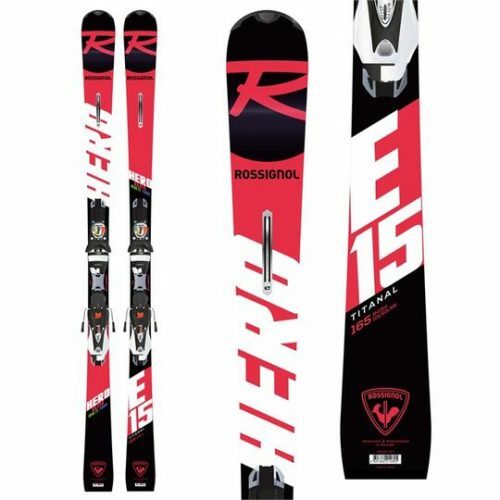 Powder Turn Rocker – Designed for the deep days, Rossignol’s most progressive rocker/camber profile delivers an award-winning balance of confident versatility and effortless float. The blend of longer, lower tip rocker, tapered tail profile, and traditional camber underfoot allows easy steering, instant speed control and the power, energy, and grip to get you back to the lift. On Trail Rocker | 90% Camber / 10% Tip Rocker – Designed for on-trail precision, On Trail Rocker features traditional camber through 90% of the ski length for explosive power, snap and edge grip, with subtle tip rocker for easier turn initiation and control. Prop Tech – Developed in response to FIS turn radius regulations, PROP TECH supplies an adaptive torsional flex through the forebody of the ski for superior power transfer and control. Vertically machined cuts in the metal laminate release the torsional flex, allowing smoother, more comfortable turn initiation and improved edge contact. Oversized Sidecut – Combining deep carving sidecuts with wider, modern waist widths, this profile delivers powerful carving precision and edge grip while increasing stability and control. LCT (Line Control Technology) – An evolution of World Cup racing innovation, Rossignol’s patented new LCT construction harnesses pure power and energy, delivering fluid stability in all conditions. Featuring a central “Power Rail” integrated from tip-to-tail, LCT eliminates counter-flexing of the ski to ensure consistently smooth stability and dynamic control of your line. LCT HD Core Ti – Specifically developed around groundbreaking new LCT technology, HD Core Ti is a new Titanal infused construction that balances high-definition power, dampness, stability, and drive with the lively, dynamic mobility for mixed snow conditions and changing terrain. Konect Binding System – The new integrated system that is set to revolutionize top-end ski equipment. From the width of the beams to the spacing of the screws and the technical features of the materials used; every detail has been carefully studied to deliver maximum skiability, so that all pressure exerted by the skier is transmitted directly to the skis. The Konect system features Dual WTR technology and is available with the SPX and NX technologies.